« “Navijazz with love” in the Kube room, on Saturday, December 15 from 8:30 p.m. The streets of Tarifa from the sports center to the framework of the historic center will be next December 15 the natural scenario of a terror ditch where zombies will persecute survivors in a night of strategy, dexterity and agility. The trend of the zombie event comes to Tarifa from the hand of “Last Day Alternative leisure” with the impulse of the local City Council. The youth councilor, Antonio Cádiz and the mayor, Francisco Ruiz presented today the poster announcing a proposal that add alternatives for leisure. 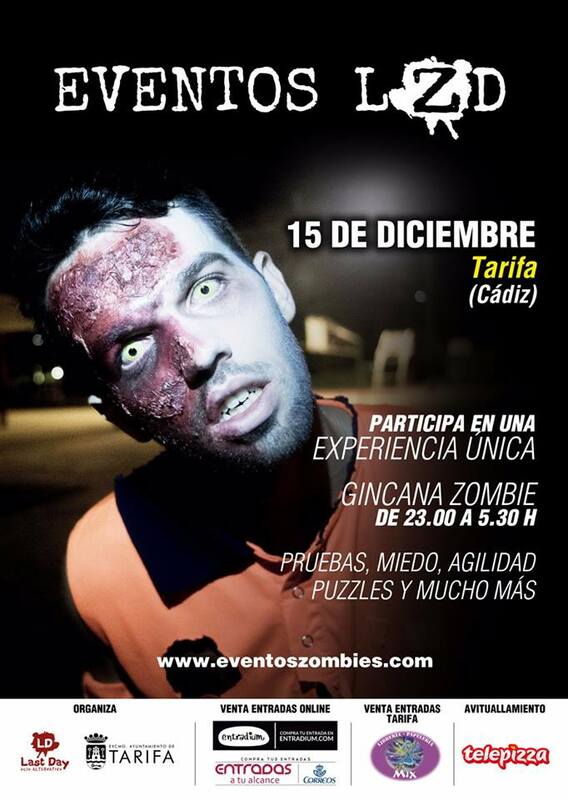 On December 15, between 11.00 and 05.30 hours, Tarifa hosts a terror game in which contestants-survivors will have to pass tests distributed along an urban route plagued by zombies. It’s like a role play on the street. The stage is the framework of the city itself. For public and private buildings, streets and squares there will be five tests in a kind of gymkhana “The challenge for the registered is to survive a whole night of frights in which the” survivors “will be assaulted and besieged by” zombies “of different fur. If they manage to reach the end of the day, they will have overcome the challenge of the zombie attack. Each player will be clearly identified with a colored garment. The SURVIVORS are GREEN and must escape and avoid contamination of the Red ZOMBIES. Within the zombies there are also variants: there are the “viral” or right-handed runners of color YELLOW and ORANGE that further complicate survival. There are also the so-called MILITARY AND ACTORS, identified with uniforms or some garment of color YELLOW. They are called to add ambience to the passing of the tests. Everything will be developed in the real area of ​​the streets of Tarifa and the participant will have to respect the normal rules in their mobility through public roads. The “Zombie” events are not conceived as a competitive game. It is more about applying skill and ability to overcome trials and avoid the constant threat of zombies. The rules are very marked. For example, zombies can not run, or plan ambushes, and must act at all times giving maximum realism to the game. There is a horde coordinator who watches over them and can exclude them if they do not follow the rules of the game. The inscriptions with prices that range between 15 and 25 euros, are already underway in entradium.com and in Correos. Also local establishments such as the “Papelería Mix” facilitate registration. Other local businesses such as TelePizza collaborate with the event as a refreshment point for the long night that awaits the participants. In this line, the Councilor for Youth, Antonio Cádiz said today that other establishments can join the event as collaborators. The mayor, Francisco Ruiz, also invited the citizens to enjoy an alternative event in the weekend nightlife. Interacting with the characters of the plot helps the survivors to fulfill their destiny which is none other than to reach the end of the game, so that realism also prevails as a factor to empower by the enrolled. All this wants to be done in Tarifa on December 15 with the organization of Last Day Z and the municipal collaboration.